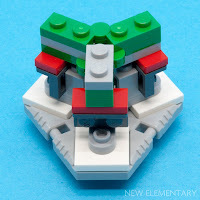 In January I made many observations about the geometry of new LEGO® piece 27255, the "Nexogon". There's plenty more to discover though and some of our featured builders are describing their experiments, including Neil Crosby (thevoicewithin on Flickr) who recently created a round one-man spaceship from a Nexogon for us. 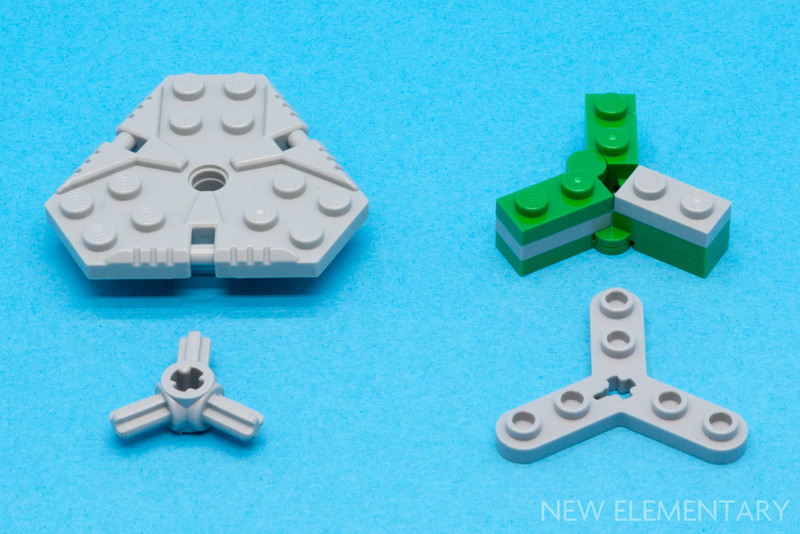 When I first saw the Nexogon I knew it was going to be a piece I wanted to play with. 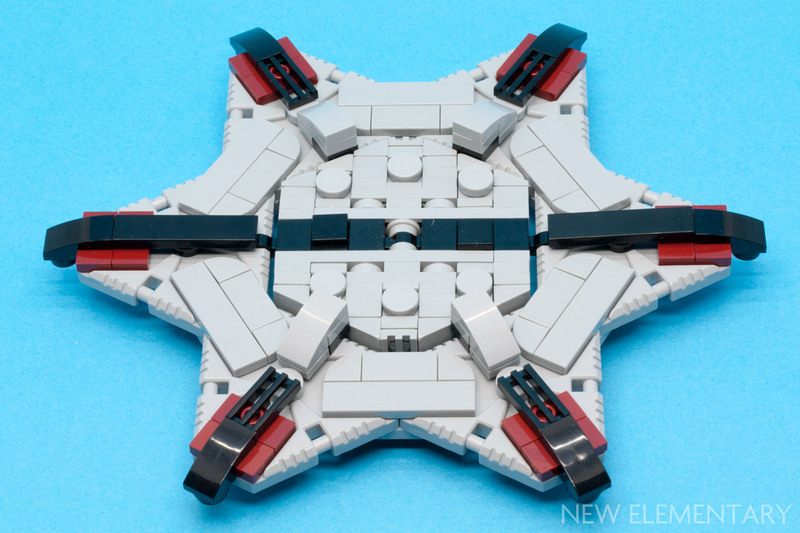 I've always liked geometric shapes and taking things off the LEGO grid, so having another piece with studs in multiple directions on a plane was exciting. When I first got my hands on one I started playing, just trying to work out how the things fitted together and what connections weren't immediately obvious from looking at them. So, this post isn't going to be a "look at the pretty final model" post. Those posts are great, but to be honest as a reader I sometimes find them a bit intimidating. The thought "I could never get there" has crossed my mind plenty of times in the past when I see the wonderfully intricate pieces that some people come up with. Instead, this post is me documenting some of the process that I went through in my exploration of the Nexogon. Nothing's a final piece, but hopefully some of the connections in here will be useful to some of you. First up; one of the very first things I did with the Nexogon. It's useful to know that the space between the 2x2 connection points and the central stud hole is half a stud wide, which means you can place a 1x2 plate with rail on each one, tightly forming a triangle. 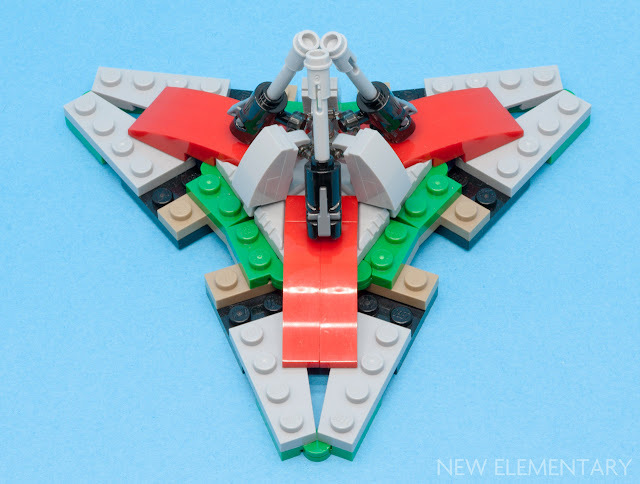 This is, however, only possible on the underside of the Nexogon without raising by one plate first, due to the lip designed to surround a pentagonal Nexo shield. 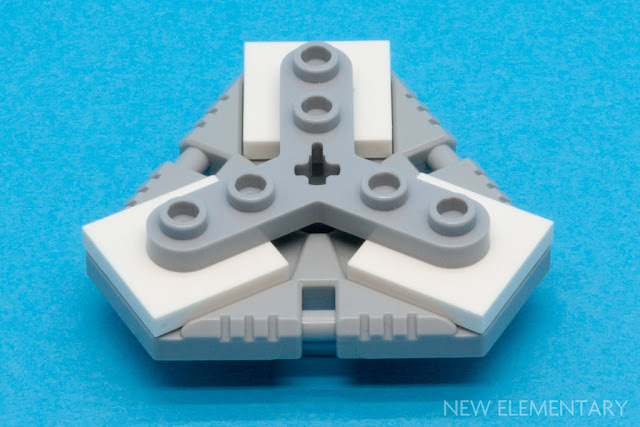 Staying with connections on the bottom of the shield, I then tried to create an isosceles triangle between two of the 2x2 connection points. 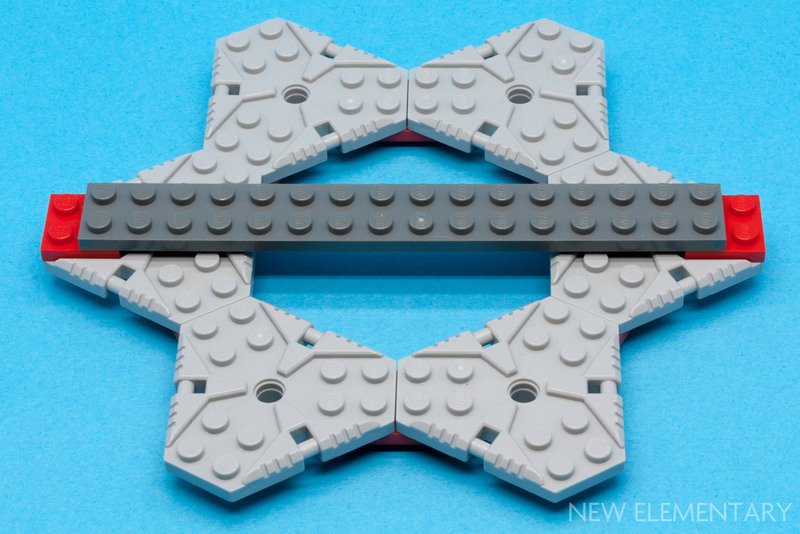 As it turns out, the long side of this triangle ends up being four studs and half a plate (10.5 plates) long. So some juggling was needed to joint the two. As you can see this was possible with the combination of the back of an Erling brick (Design ID 4070) and a bracket. I've no idea if this will ever be useful, but that's not really the point of trying things out with a tablescrap, is it? 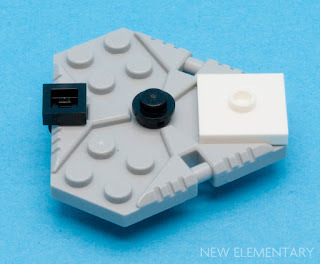 Moving on, I reminded myself of the basic options we already have within the LEGO System for 120° angles. 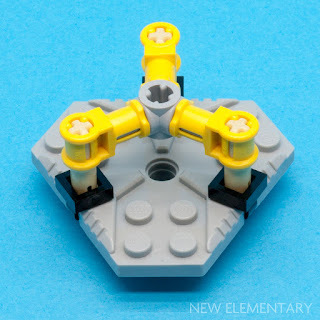 Actually, I forgot one — Minifig, Weapon Holder Ring (Design ID 20612) — and I'm sure there are others. Regardless, these are the ones I decided to play with for the remainder of these tablescraps. 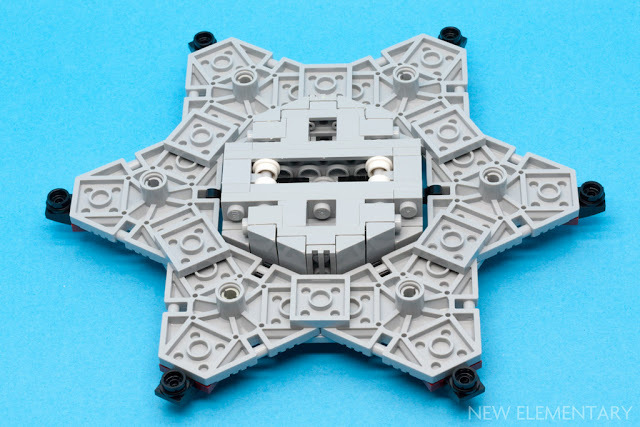 The Technic, Plate Rotor 3 Blade with Smooth Ends and 6 Studs (Design ID 32125) gave me my first minor breakthrough of proper knowledge of the Nexogon. As it turns out (and I'm sure completely deliberately) simply by applying a 2x2 jumper to each of the 2x2 connection points, the propeller fits perfectly onto the Nexogon. Unfortunately though, the same couldn't be said about the hinge combination. 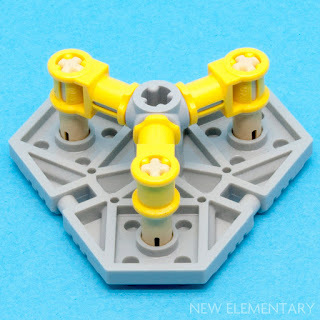 Because this has no gap in the centre, its studs don't sit in the same vertical space as the propeller. As luck would have it though, we can bridge this gap in a similar way as we did before, using an Erling brick and a bracket. If nothing else, it was interesting getting these pieces to come together. Maybe something can come of this in the future. Playing with Technic, Axle Connector Hub with 3 Axles (Design ID 57585) we see similar properties. In this case you can see it connecting to the Nexogon via the clip connection points or via the anti-studs on the bottom. The breakthrough with the propeller led me on to a few more experiments. First up was confirming the distance between various points on the Nexogon. Here all three highlighted stud points are three studs apart from each other (although the anti-stud is half a plate higher than the studs. I leave this as an exercise to the reader to solve). This leads to quite a few interesting properties. For example, if you create a hexagon of Nexogons you can see that it is exactly 18 studs wide. 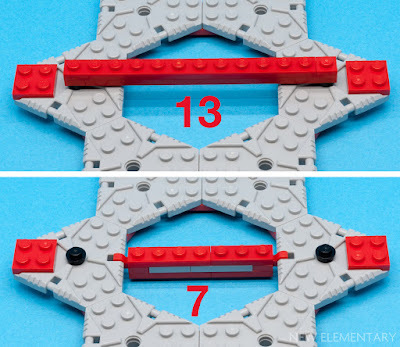 Continuing in this manner, you can determine that the space between opposite Nexosockets is 13 studs, and if you connect via the hinge connection points, you have space for a seven-stud wide object. For me, this was all hugely exciting, so whilst playing, I decided to see if I could fill that central hole. Now, I'm not ashamed to admit that I blatantly used the same technique as Tim Goddard to create some smooth 30 degree angles with cheese slopes (since a nice 90° brick plus a 30° slope equals 120°, the internal angle of a regular hexagon). Add in a bit of snot to invert my plates so that I could use the cheese on both top and bottom, and voilà: a near-perfectly shaped hexagon to fill the void. 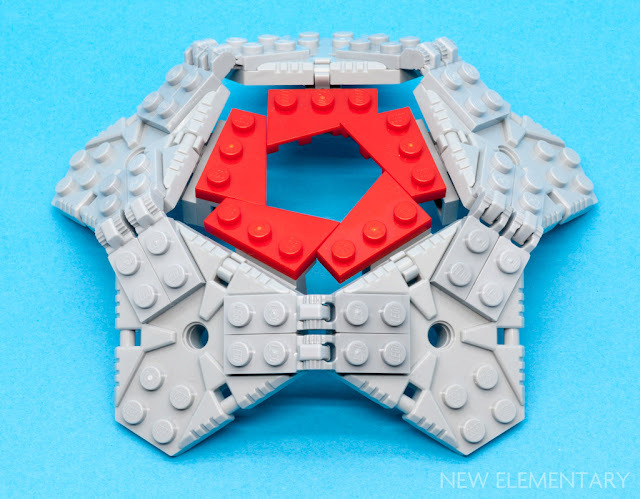 The only cheat I had to make on the shape was at the top and bottom - since the width of the hexagon was an odd number of studs I couldn't taper to a point perfectly. Honestly though, that wasn't the end of the world. 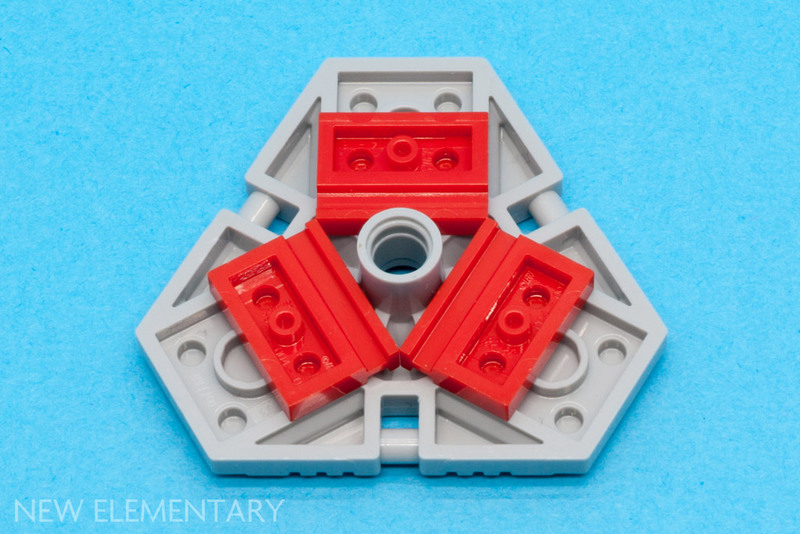 Looking at the Nexogon hexagon tablescrap from behind, you should be able to see see how I put together the structure to smoothly graduate the cheese in this instance, as well as performing the stud reversal at the core. Almost at the end now - don't flag! The penultimate thing I tried was converting the hexagon into a pentagon, and doing something vaguely interesting with the inside. Here, the wedge plates are placed such that were you to place hinge plates atop them, they would fit nicely. This made me happy. You can see from behind that once again the star of the show is the humble bracket. And, finally, we have a whole lot of angles going on at once. 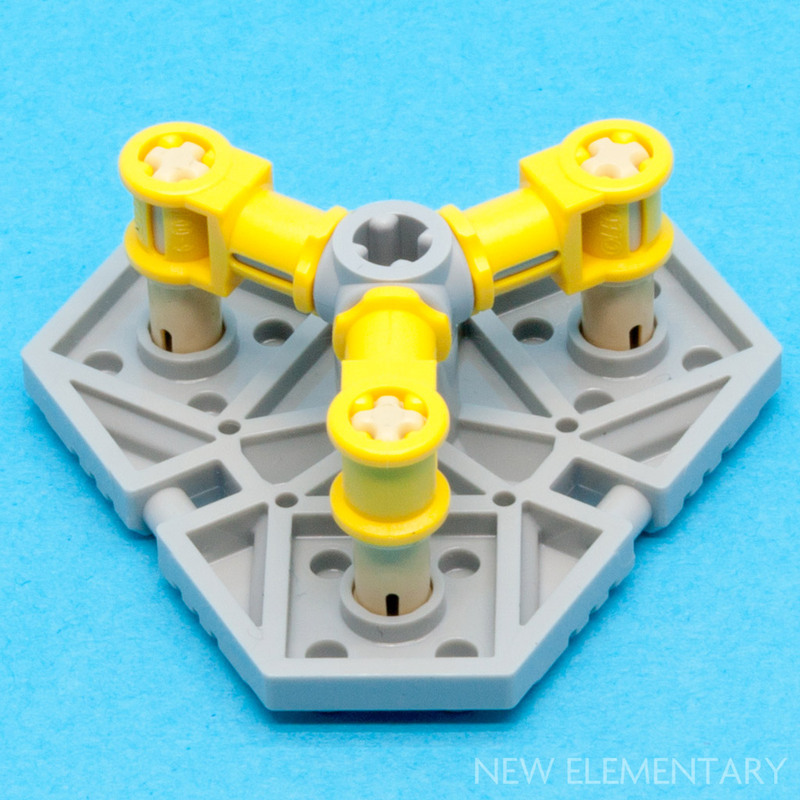 It might not be immediately obvious, but each one of the points coming off the Nexogon here is a perfect 45° angle, bisected by the centre of the Nexogon’s 2x2 connection points. Rising off the centre of the Nexogon is a structure lifting into a Ninjago weapon holder ring, which allows another angle change courtesy of the stud guns. 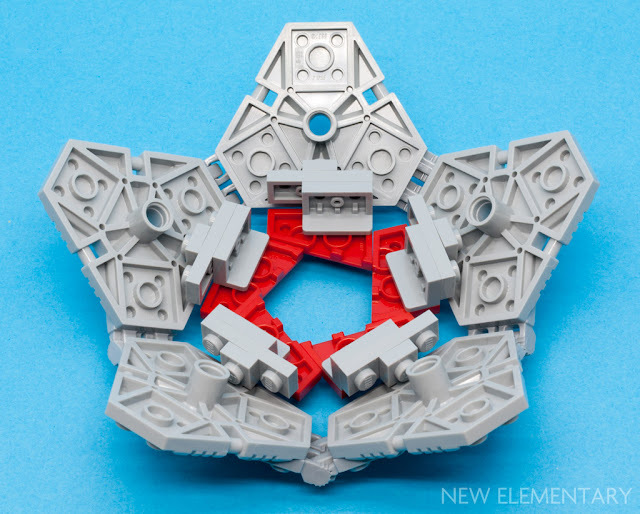 At this point, I've had a lot of fun playing with the Nexogon, and I'm sure I've only just grazed the surface of what it's possible to do with the part. I'm really looking forward to seeing what everybody else ends up doing with it too. Very nice work. I appreciate this exploration of the geometry. I especially enjoyed the pentagon example! Thanks - I was quite pleased managing to get that to come together so that the studs on the triangular plates would end up being connectable. Some really useful techniques here. I especially appreciate the ways you've put a cross axle in the centre. It means we can turn it with technic mechanisms. Thanks! Fantastic article! It always amazes me how the geometry of seemingly incompatible pieces can mesh so perfectly with the existing system. This is fantastic! What can you make with it?